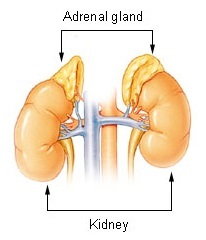 The adrenal glands are endocrine glands that produce a variety of hormones including adrenaline and the steroids aldosterone and cortisol. They are found above the kidneys. Each gland has an outer cortex which produces steroid hormones and an inner medulla. The adrenal cortex itself is divided into three zones: the zona glomerulosa, the zona fasciculata and the zona reticularis. The bacterial infection leads to massive bleeding into one or (usually) both adrenal glands. It is characterized by overwhelming bacterial infection meningococcemia leading to massive blood invasion, organ failure, coma, low blood pressure and shock, disseminated intravascular coagulation (DIC) with widespread purpura, rapidly developing adrenocortical insufficiency and death. A coma is a deep state of prolonged unconsciousness in which a person cannot be awakened; fails to respond normally to painful stimuli, light, or sound; lacks a normal wake-sleep cycle; and does not initiate voluntary actions. Coma patients exhibit a complete absence of wakefulness and are unable to consciously feel, speak or move. Comas can be derived by natural causes, or can be medically induced. Hypotension is low blood pressure, especially in the arteries of the left sided systemic circulation. Blood pressure is the force of blood pushing against the walls of the arteries as the heart pumps out blood. A systolic blood pressure of less than 90 millimeters of mercury or diastolic of less than 60 mm Hg is generally considered to be hypotension. However, in practice, blood pressure is considered too low only if noticeable symptoms are present. Shock is the state of not enough blood flow to the tissues of the body as a result of problems with the circulatory system. Initial symptoms may include weakness, fast heart rate, fast breathing, sweating, anxiety, and increased thirst. This may be followed by confusion, unconsciousness, or cardiac arrest as complications worsen. Sepsis is a life-threatening condition that arises when the body's response to infection causes injury to its own tissues and organs. Common signs and symptoms include fever, increased heart rate, increased breathing rate, and confusion. There may also be symptoms related to a specific infection, such as a cough with pneumonia, or painful urination with a kidney infection. In the very young, old, and people with a weakened immune system, there may be no symptoms of a specific infection and the body temperature may be low or normal, rather than high. Severe sepsis is sepsis causing poor organ function or insufficient blood flow. Insufficient blood flow may be evident by low blood pressure, high blood lactate, or low urine output. Septic shock is low blood pressure due to sepsis that does not improve after fluid replacement. A petechia is a small (1–2 mm) red or purple spot on the skin, caused by a minor bleed from broken capillary blood vessels. Purpura is a condition of red or purple discolored spots on the skin that do not blanch on applying pressure. The spots are caused by bleeding underneath the skin secondary to platelet disorders, vascular disorders, coagulation disorders, or other causes. They measure 0.3–1 cm (3–10 mm), whereas petechiae measure less than 3 mm, and ecchymoses greater than 1 cm. Meningococcus is another term for the bacterial species Neisseria meningitidis ; blood infection with said species usually underlies WFS. While many infectious agents can infect the adrenals, an acute, selective infection is usually meningococcus. Mycobacterium tuberculosis could also cause WFS. Tubercular invasion of the adrenal glands could cause hemorrhagic destruction of the glands and cause mineralocorticoid deficiency. Pseudomonas aeruginosa is a common encapsulated, Gram-negative, rod-shaped bacterium that can cause disease in plants and animals, including humans. A species of considerable medical importance, P. aeruginosa is a multidrug resistant pathogen recognized for its ubiquity, its intrinsically advanced antibiotic resistance mechanisms, and its association with serious illnesses – hospital-acquired infections such as ventilator-associated pneumonia and various sepsis syndromes. Streptococcus pneumoniae, or pneumococcus, is a Gram-positive, alpha-hemolytic or beta-hemolytic, facultative anaerobic member of the genus Streptococcus. They are usually found in pairs (diplococci) and do not form spores and are nonmotile. As a significant human pathogenic bacterium S. pneumoniae was recognized as a major cause of pneumonia in the late 19th century, and is the subject of many humoral immunity studies. Cytomegalovirus can cause adrenal insufficiency,  especially in the immunocompromised. Cytomegalovirus (CMV) is a genus of viruses in the order Herpesvirales, in the family Herpesviridae, in the subfamily Betaherpesvirinae. Humans and monkeys serve as natural hosts. There are currently eight species in this genus including the type species, Human betaherpesvirus 5, which is the species that infects humans. 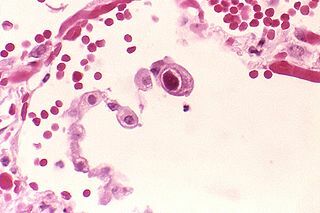 Diseases associated with HHV-5 include mononucleosis, and pneumonia. In the medical literature, most mentions of CMV without further specification refer implicitly to human CMV. Human CMV is the most studied of all cytomegaloviruses. Diagnostic criteria is based on clinical features of adrenal insufficiency as well as identifying the causal agent. If the causal agent is suspected to be meningitis a lumbar puncture is performed. If the causal agent is suspected to be bacterial a blood culture and complete blood count is performed. The Centers for Disease Control and Prevention (CDC) is the leading national public health institute of the United States. The CDC is a United States federal agency under the Department of Health and Human Services and is headquartered in Atlanta, Georgia. The spleen is an organ found in virtually all vertebrates. Similar in structure to a large lymph node, it acts primarily as a blood filter. The word spleen comes from Ancient Greek σπλήν (splḗn). A splenectomy is the surgical procedure that partially or completely removes the spleen. Conjunctivitis, also known as pink eye, is inflammation of the outermost layer of the white part of the eye and the inner surface of the eyelid. It makes the eye appear pink or reddish. Pain, burning, scratchiness, or itchiness may occur. The affected eye may have increased tears or be "stuck shut" in the morning. Swelling of the white part of the eye may also occur. Itching is more common in cases due to allergies. Conjunctivitis can affect one or both eyes. Lipopolysaccharides (LPS), also known as lipoglycans and endotoxins, are large molecules consisting of a lipid and a polysaccharide composed of O-antigen, outer core and inner core joined by a covalent bond; they are found in the outer membrane of Gram-negative bacteria. Adrenal insufficiency is a condition in which the adrenal glands do not produce adequate amounts of steroid hormones, primarily cortisol; but may also include impaired production of aldosterone, which regulates sodium conservation, potassium secretion, and water retention. Craving for salt or salty foods due to the urinary losses of sodium is common. Asplenia refers to the absence of normal spleen function and is associated with some serious infection risks. Hyposplenism is used to describe reduced ('hypo-') splenic functioning, but not as severely affected as with asplenism. An overwhelming post-splenectomy infection (OPSI) or overwhelming post-splenectomy sepsis (OPSS) is a rare but rapidly fatal infection occurring in individuals following removal of the spleen. The infections are typically characterized by either meningitis or sepsis, and are caused by encapsulated organisms including Streptococcus pneumoniae. MeNZB was a vaccine against a specific strain of group B meningococcus, used to control an epidemic of meningococcal disease in New Zealand. Most people are able to carry the meningococcus bacteria safely with no ill effects. However, meningococcal disease can cause meningitis and septicaemia, resulting in brain damage, failure of various organs, severe skin and soft-tissue damage, and death. 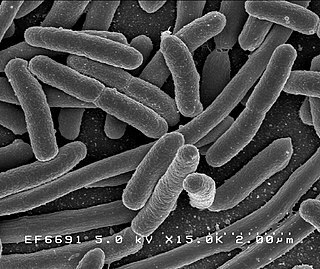 The bacterial capsule is a very large structure of many bacteria. It is a polysaccharide layer that lies outside the cell envelope, and is thus deemed part of the outer envelope of a bacterial cell. It is a well-organized layer, not easily washed off, and it can be the cause of various diseases. Brazilian purpuric fever (BPF) is an illness of children caused by the bacterium Haemophilus influenzae biogroup aegyptius which is ultimately fatal due to sepsis. BPF was first recognized in the São Paulo state of Brazil in 1984. At this time, young children between the ages of 3 months and 10 years were contracting a strange illness which was characterized by high fever and purpuric lesions on the body. These cases were all fatal, and originally thought to be due to meningitis. It was not until the autopsies were conducted that the cause of these deaths was confirmed to be infection by H. influenzae aegyptius. Although BPF was thought to be confined to Brazil, other cases occurred in Australia and the United States during 1984–1990. ICD-10 is an international statistical classification used in health care and related industries. 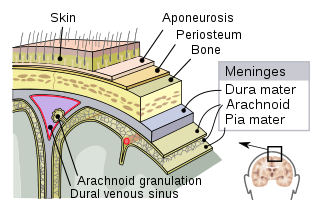 Meningococcal disease describes infections caused by the bacterium Neisseria meningitidis. It has a high mortality rate if untreated but is vaccine-preventable. While best known as a cause of meningitis, it can also result in sepsis, which is an even more damaging and dangerous condition. Meningitis and meningococcemia are major causes of illness, death, and disability in both developed and under-developed countries. George D. Heist (1886–1920) was an immunologist specializing in the study of infections of meningococcal bacteria that often result in meningococcal disease, which is well known as highly lethal and debilitating, and extremely difficult to treat. Adrenal crisis is a medical emergency and potentially life-threatening situation requiring immediate emergency treatment. It is a constellation of symptoms that indicate severe adrenal insufficiency caused by insufficient levels of the hormone cortisol. This may be the result of either previously undiagnosed or untreated Addison's disease, a disease process suddenly affecting adrenal function, suddenly stopping intake of glucocorticoids or an intercurrent problem in someone known to have Addison's disease, congenital adrenal hyperplasia (CAH), or other form of primary adrenal insufficiency. NmVac4-A/C/Y/W-135 is the commercial name of the Meningococcal meningitis polysaccharide serogroups A,C,Y and W-135 vaccine of JN-International Medical Corporation. The product is specially designed and formulated to be used in developing countries for protecting populations during meningitis disease epidemics. Meningococcal meningitis is a bacterial infection caused by the bacterium Neisseria meningitidis, also known as meningococcus. The vaccine is made from bacterial capsular polysaccharides through fermentation of each individual serogroup of Neisseria meningitidis in bioreactors. Then the polysaccharides are purified, formulated and lyophilized using preservatives and stabilizers to make a vaccine product. The vaccine cannot protect other than Neisseria meningitidis serogroups A,C,Y and W-135 or cannot completely protect from these serogroups. Meningitis is an acute inflammation of the protective membranes covering the brain and spinal cord, known collectively as the meninges. The most common symptoms are fever, headache, and neck stiffness. Other symptoms include confusion or altered consciousness, vomiting, and an inability to tolerate light or loud noises. Young children often exhibit only nonspecific symptoms, such as irritability, drowsiness, or poor feeding. If a rash is present, it may indicate a particular cause of meningitis; for instance, meningitis caused by meningococcal bacteria may be accompanied by a characteristic rash. Meningococcal vaccine refers to any of the vaccines used to prevent infection by Neisseria meningitidis. Different versions are effective against some or all of the following types of meningococcus: A, B, C, W-135, and Y. The vaccines are between 85 and 100% effective for at least two years. They result in a decrease in meningitis and sepsis among populations where they are widely used. They are given either by injection into a muscle or just under the skin. Haemophilus meningitis is a form of bacterial meningitis caused by the Haemophilus influenzae bacteria. It is usually associated with Haemophilus influenzae type b. Meningitis involves the inflammation of the protective membranes that cover the brain and spinal cord. Haemophilus meningitis is characterized by symptoms including fever, nausea, sensitivity to light, headaches, stiff neck, anorexia, and seizures. Haemophilus meningitis can be deadly, but antibiotics are effective in treating the infection, especially when cases are caught early enough that the inflammation has not done a great deal of damage. Before the introduction of the Hib vaccine in 1985, Haemophilus meningitis was the leading cause of bacterial meningitis in children under the age of five. However, since the creation of the Hib vaccine, only two in every 100,000 children contract this type of meningitis. Five to ten percent of cases can be fatal, although the average mortality rate in developing nations is seventeen percent, mostly due to lack of access to vaccination as well as lack of access to medical care needed to combat the meningitis. In 1928, Neisseria flavescens was first isolated from cerebrospinal fluid in the midst of an epidemic meningitis outbreak in Chicago. These gram-negative, aerobic bacteria reside in the mucosal membranes of the upper respiratory tract, functioning as commensals. However, this species can also play a pathogenic role in immunocompromised and diabetic individuals. In rare cases, it has been linked to meningitis, pneumonia, empyema, endocarditis, and septicemia. ↑ "Waterhouse–Friderichsen syndrome". Genetic and Rare Diseases Information Center (GARD). Retrieved 14 December 2012. 1 2 Kumar V, Abbas A, Fausto N (2005). Robins and Coltran: Pathological Basis of Disease (7th ed.). Elsevier. pp. 1214–5. ISBN 978-0-7216-0187-8. ↑ "Waterhouse-Friderichsen syndrome". MedlinePlus Medical Encyclopedia. Retrieved 2014-04-12. ↑ Adem P, Montgomery C, Husain A, Koogler T, Arangelovich V, Humilier M, Boyle-Vavra S, Daum R (2005). "Staphylococcus aureus sepsis and the Waterhouse-Friderichsen syndrome in children". N Engl J Med. 353 (12): 1245–51. doi:10.1056/NEJMoa044194. PMID 16177250. ↑ Morrison U, Taylor M, Sheahan DG, Keane CT (January 1985). "Waterhouse-Friderichsen syndrome without purpura due to Haemophilus influenzae group B". Postgrad Med J. 61 (711): 67–8. doi:10.1136/pgmj.61.711.67. PMC 2418124 . PMID 3873065. ↑ McKinney WP, Agner RC (December 1989). "Waterhouse-Friderichsen syndrome caused by Haemophilus influenzae type b in an immunocompetent young adult". South. Med. J. 82 (12): 1571–3. doi:10.1097/00007611-198912000-00029. PMID 2595428. ↑ Uno, Kenji; Konishi, Mitsuru; Yoshimoto, Eiichiro; Kasahara, Kei; Mori, Kei; Maeda, Koichi; Ishida, Eiwa; Konishi, Noboru; Murakawa, Koichi; Mikasa, Keiichi (1 January 2007). "Fatal Cytomegalovirus-Associated Adrenal Insufficiency in an AIDS Patient Receiving Corticosteroid Therapy". Internal Medicine. 46 (9): 617–620. doi:10.2169/internalmedicine.46.1886. PMID 17473501. ↑ Rosa D, Pasqualotto A, de Quadros M, Prezzi S (2004). "Deficiency of the eighth component of complement associated with recurrent meningococcal meningitis--case report and literature review" (PDF). Braz J Infect Dis. 8 (4): 328–30. doi:10.1590/S1413-86702004000400010. PMID 15565265. ↑ Waterhouse R (1911). "A case of suprarenal apoplexy". Lancet . 1 (4566): 577–8. doi:10.1016/S0140-6736(01)60988-7. ↑ Friderichsen C (1918). "Nebennierenapoplexie bei kleinen Kindern". Jahrbuch für Kinderheilkunde und Physische Erziehung. 87: 109–25.